9½" (24 cm) hand circumference and 11½" (29 cm) long. First Frost Cozy Folk Knitting is available in print and eBook. 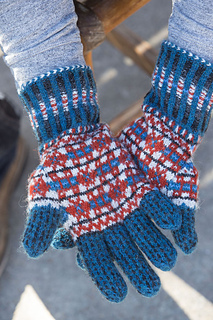 These gloves are a great example of how an unmistakably Nordic-looking design can be achieved by combining traditional knitting techniques from various Northern countries. Traditional Fair Isle patterns and a Shetland color palette are complemented with a colorful Estonian braided cast-on and a patterned rib. A three-color band of Estonian nuppid (or knotted) relief stitches decorate the wrist, and duplicate stitches and French knots are worked in gold and bright blue to further embellish the Fair Isle motifs on the front of the gloves. To help you distinguish between the front and back (palms) of the gloves, which are both knitted with the same geometric patterns, only the fronts have been embroidered. The Matti gloves have been designed to be practical working gloves and have a well-shaped thumb gusset and individual forchettes between each of the fingers to allow ease of movement. 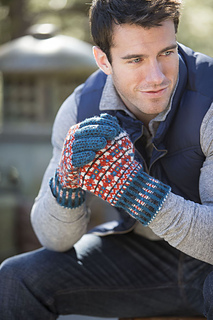 You could also increase the warmth factor by wearing these gloves over the top of a much finer pair. Needles Set of 5 size U.S. 2 (2.75 mm) double-pointed (dpn). Adjust needle size if necessary to obtain the correct gauge. Notions Markers (m); waste yarn or holder; tapestry needle.